Vancouver, British Columbia -Velocity Minerals Ltd. (TSXV: VLC) ("Velocity" or the "Company") announces that it has received additional positive assay results from step-out drilling at East Zone, Rozino gold project, with all 2018 drill holes intersecting gold mineralization. The first drill hole of 2018 (RDD-044) intersected 30.8m grading 1.55g/t gold and 66.5m grading 1.32g/t gold (Figure 1). This news release includes results from RDD-045 through RDD-049 and these drill holes have each stepped out 50m to 100m from drill hole RDD-044 and continue to expand the zone. 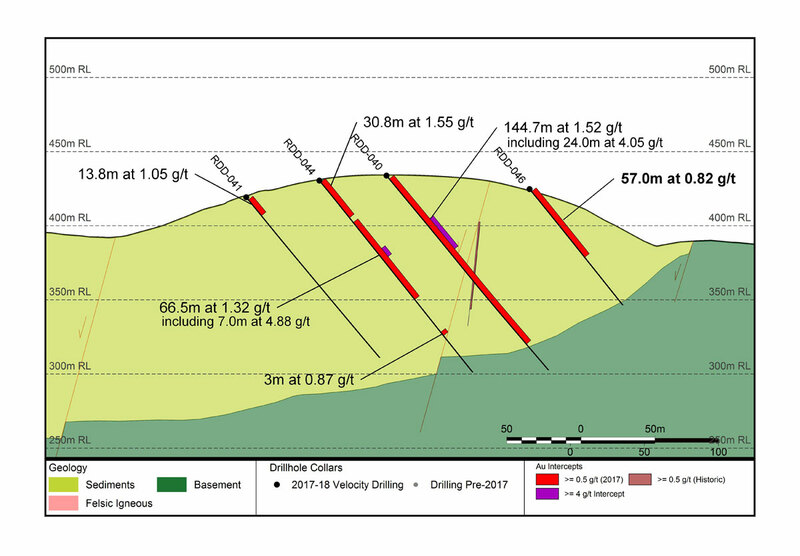 Highlights include RDD-046 (Figure 1), which intersected 57.0m grading 0.82g/t gold, having stepped 100m to the northeast from previous drill hole RDD-040 (144.7m grading 1.52g/t gold). "Rozino's East Zone continues to deliver long, consistent intersections of gold mineralization from surface, grading approximately 0.7g/t gold to 1.5g/t gold. Stepping out 50m to 100m at a time, we are continuing to expand the footprint of this newly discovered zone, which remains open for expansion," stated Keith Henderson, Velocity's President and CEO. "Velocity recently announced a maiden inferred resource at Rozino for 629,000 ounces grading 1.15g/t gold assuming a 0.5g/t gold cut-off grade. The drill results announced today were not included in the inferred resource but will form part of an updated mineral resource estimate and preliminary economic assessment in Q3 this year." together with previous results from RDD-040, RDD-041, and RDD-044. together with previous results from RDD-042. 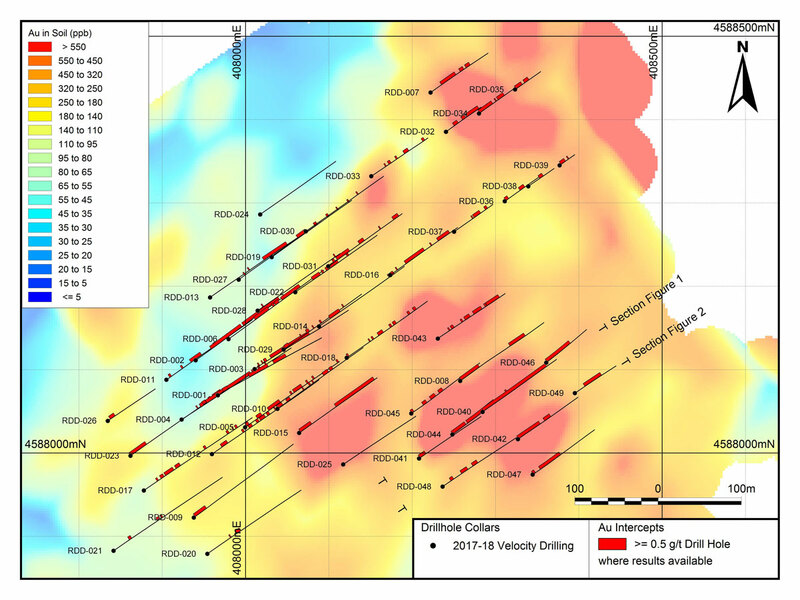 Figure 3: Rozino surface geochemistry map with drill intercepts averaging greater than 0.5g/t gold highlighted. 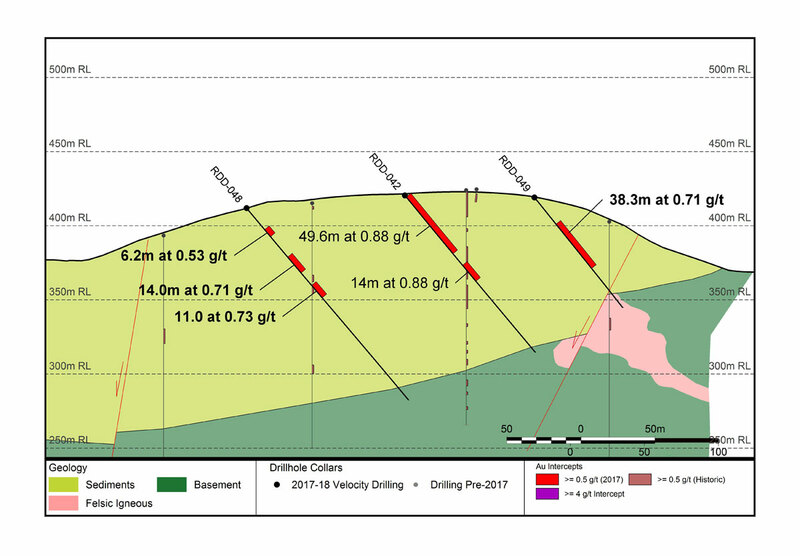 Velocity has been exploring and drilling at Rozino since August 2017, completing 7,300m of diamond drilling in 2017 and publishing a maiden Inferred Mineral Resource Estimate in Q1 2018; 17Mt @ 1.15g/t gold for 629,000 ounces at 0.5g/t cut-off grade with 8.2Mt @ 1.68g/t gold for 443,000 ounces at 0.8g/t cut-off grade. Approximately 90% of estimated resources at depths of less than 110m from surface and less than 1% below 150m from surface. Mineralization remains open for expansion. The Company continues to drill in 2018 with a view to publishing an updated mineral resource estimate and preliminary economic assessment ("PEA") in Q3 2018, approximately one year after initiating exploration. On completion of the PEA, the Company will exercise its option for a 70% interest in the project and will move forward in joint venture with its Bulgarian partner. Velocity formed an Exploration and Mining Alliance ("Alliance") with Bulgarian operating partner Gorubso Kardzhali A.D. ("Gorubso") in February 2018. The Alliance is the cornerstone of the Balkan Gold Project. Within the Balkan Gold Project, the Company's portfolio of assets in Bulgaria includes exclusive access to a modern, centrally located CIL plant for processing of material from gold projects in the surrounding area. The Company has negotiated an option to earn a 70% interest in any or all of seven advanced gold projects, including the Rozino Project where drilling is ongoing. In addition, the Company has negotiated an option to earn a 50% interest in the operating Chala Gold Mine. The Alliance area covers all existing and future Gorubso and Velocity projects within an area of 10,400km2 covering the prospective Eastern Rhodope Gold Mining District in southeastern Bulgaria. The Agreement contemplates the exploration, development, and mining of the various projects within the Alliance area and provides for an option/joint venture mechanism by which Velocity and Gorubso will partner to maximize value for both companies. Velocity is a gold exploration and development company focused on eastern Europe. The Company's management and board includes mining industry professionals with over 100 years of combined experience spanning Europe, Asia, and the Americas as employees of major mining companies as well as founders and senior executives of junior to mid-tier public companies. The team's experience includes all aspects of mineral exploration, resource definition, feasibility, finance, mine construction and mine operation as well as a track record in managing publicly listed companies. CAUTIONARY STATEMENT REGARDING FORWARD-LOOKING INFORMATION: This news release includes certain "forward-looking statements" under applicable Canadian securities legislation. Forward-looking statements include, but are not limited to, statements with respect to: future exploration and testing carried out on the Tintyava property; use of funds; and the future business and operations of Velocity. Often, but not always, forward looking statements can be identified by words such as "pro forma", "plans", "expects", "may", "should", "budget", "scheduled", "estimates", "forecasts", "intends", "anticipates", "believes", "potential" or variations of such words including negative variations thereof, and phrases that refer to certain actions, events or results that may, could, would, might or will occur or be taken or achieved. Forward looking information involves known and unknown risks, uncertainties and other factors which may cause the actual results, performance or achievements of the Company to differ materially from any future results, performance or achievements expressed or implied by the forward-looking information. Such risks and other factors include, among others, operating and technical difficulties in connection with mineral exploration and development and mine development activities for the Tintyava property, including the geological mapping, prospecting and sampling programs for the projects, the fact that the Company's interests in the Tintyava property is only an option and there is no guarantee that the interest, if earned, will be certain, actual results of exploration activities, including the program, estimation or realization of mineral reserves and mineral resources, the timing and amount of estimated future production, costs of production, capital expenditures, the costs and timing of the development of new deposits, the availability of a sufficient supply of water and other materials, requirements for additional capital to fund the Company's business plan, future prices of precious metals, changes in general economic conditions, changes in the financial markets and in the demand and market price for commodities, possible variations in ore grade or recovery rates, possible failures of plants, equipment or processes to operate as anticipated, accidents, labour disputes and other risks of the mining industry, delays in obtaining governmental and regulatory approvals (including of the TSX Venture Exchange), permits or financing or in the completion of development or construction activities, changes in laws, regulations and policies affecting mining operations, hedging practices, currency fluctuations, title disputes or claims limitations on insurance coverage and the timing and possible outcome of pending litigation, environmental issues and liabilities, risks related to joint venture operations, and risks related to the integration of acquisitions, as well as those factors discussed under the heading. "Risk Factors" in the Company's annual management's discussion and analysis and other filings of the Company with the Canadian Securities Authorities, copies of which can be found under the Company's profile on the SEDAR website at www.sedar.com.